On Sunday, we took the van to Bawsinch, and hopped out. All eight of us. There were four leaders and four participants, so it was small, and that is ALWAYS fun! We walked through some woods, and came to our first tree planting spot. We got through loads! Then we swapped with the boys, and burned wood for a while. Celestine found a skull! We tried (and almost managed) to light the storm kettles, and drank some lovely hot chocolate. Then we ate lunch, and headed to site number 2. To get there we had to walk through some truly magical woods. I thought Oberon and Titania would leap out at any moment! We planted MORE trees, and then climbed some rather bigger ones! 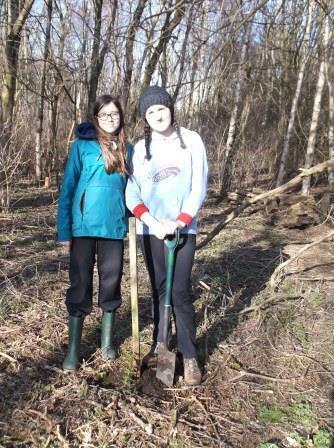 We ambled slowly back to the entrancy area, and planted IF POSSIBLE EVEN MORE TREES!! Then we did a bit of sit spotting and I got my John Muir award! Another great day to be alive, and outside!